We all know polyester is wicked witch of fabrics harming the environment but is polyester easy to ditch? Yes it is with the new green fabric on the block- Blue Zipper. Unknown to you, polyester has taken over more than half your wardrobe! It’s present in our most basic garments like t-shirts, dresses, jeans and not just outdoor wear or active wear as we all thought. So much of polyester which is essentially plastic cannot be good. So today we present this new eco-friendly alternative to polyester which has all it’s pros and none of it’s cons. The key learning from COP23 fashion conference at UNFCCC side events, attended by founder Mirela Orlovic was that the fashion industry was working to reduce wastage and pollution in order to obtain a carbon neutral supply chain and economy. The battle wages on as we constantly bring to you sustainable alternatives to environmentally degrading raw materials. Jacket check! Underwear check! Bag check! T-shirt check! Now it’s time to ditch polyester and let’s start with pants. 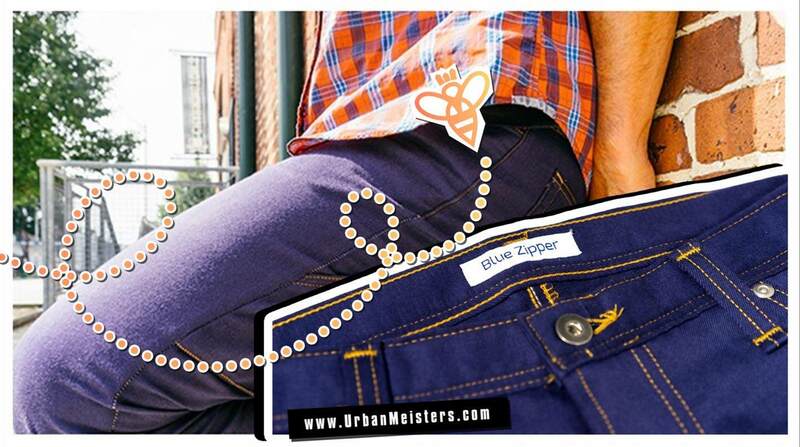 Presenting Blue Zipper- a line of comfortable, durable, eco-friendly, polyester free pants. The first problem with polyester is that it it’s derived from non-renewable petroleum resources and can take centuries to biodegrade if at all. The second issue, is microfiber water pollution. Every time we wash our polyester clothes we are actually creating microfiber water pollution. These tiny fiber particles end up in our waterways and even our food supply. This problem is global- from United States to Australia. Some stats estimate that up to 94% of U.S. tap water is contaminated by microfibers and our polyester clothes are the main cause. So we need an alternative fabric. A few years ago the founder, Stuart Berman, set out to develop an alternative to polyester fabric that is used in pants for the outdoor industry. After 3 years of rigorous research an eco-friendly, polyester free and moisture wicking cotton twill fabric was developed and Blue Zipper was born. 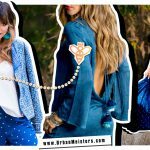 Their motto is fabrics with benefits™ and their goal is to develop and work with sustainable fabrics as well as various technologies that benefit the consumer and the environment. Polyester Free, moisture wicking, fast absorbing, quick drying cotton twill. Addressing Microfiber water pollution with our signature custom fabric. 96% Cotton, 4% Lycra® and Antimicrobial. Breathable, soft and comfortable- most especially suited for outdoor needs. So how is their cotton different from regular cotton? To create their signature fabric it takes a multi-stage process. It starts with the yarns they choose. Their cotton yarns go through a patented process that is environmentally friendly and makes them water repellent. Then they position the technology within the weave of the fabric in a certain way and craft it into the desired product. This process allows the fabric to move moisture away from your body and to the surface of the fabric. Blue Zipper also added the latest anti-microbial silver technology to the fabric. This innovative silver antimicrobial finish provides comfort and freshness protection by controlling unwanted odour-causing bacteria. Thus keeping the fabric smelling fresh and clean. The lycra is needed to allow the fabric to move sufficiently for outdoor activity without giving up comfort and style. Thus you see the Blue Zipper fabric is a multi-purpose material that is engineered for everyday use! Stuart Berman is a style and fashion industry vet, having designed and launched a successful men’s fashion brand that have been sold in the catalogues of Saks Fifth Avenue, Harrods of London and luxury boutique stores in the US. After sometime and success in the garment industry, he decided to take a different direction in life- that of developing sustainable fashion and fabrics because the desire to be in the garment business never waned. But he did want to do things differently. After going through an organic awakening and wanting a better, more natural outdoor, moisture wicking fabric, Stuart set out to develop an alternative to the current polyester used in this market. Since this type of fabric did not exist, he knew it was up to him to develop his own material from scratch. 3 years, 3 prototypes and 2 different mills in the US later, his innovative new clothing line is launching, Blue Zipper. Here is a one on one with the creator of this wonder fabric, Stuart! Hi Stuart! Tell us about some of the challenges you faced in material development and even the ones you are currently facing. Since we are the only ones with the fabric we need to figure out the correct formula. This is one reason it has taken so long. Another one of the biggest challenges with the fabric is time. It can take between 3-4 months to just make the fabric. There are so many steps in the process since it starts with the yarns to weaving then dying the material. As a small company we have to work into the mills tight production schedule. The process is also expensive. By our third prototype of the fabric we were able to get conclusive lab results on how it works. Based on this information we know that our 4th generation will achieve the results we were looking for. Our fabric is being made in the United States. This will help to assure our fabric is made right. This also adds a lot to the cost which ends up increasing the retail price on our product. This makes it more challenging to sell. Do you have plans to pitch your product to the B2B community to develop and manufacture for other brands? How do you plan to scale up production? We do not plan to do any B2B business at this time. We are looking to build our own brand at this time. Scaling up production will have it’s challenges but it’s very attainable. It would be easier for the mill to run large quantities of fabric over small. The main issue will be figuring out how much of the fabric to stock. As far production of our pants is concerned, the factories we have contacted are better equipped to handle large production than smaller. There is a break even point for most factories. The advantage I have is there are a number of factories in the US that could accommodate larger production numbers easier than smaller. Do you plan to expand the range of bottom wear to include women’s styles, more colours and cuts or even other categories like top wear? Our motto is Fabrics with Benefits™ and this is how we look to design. We are not going to just add a style or fabric because that is the traditional course of development. We will look to add the right styles with the right fabrics for the right purpose. Our initial focus is on menswear and with one silhouette in two styles and two colors we know we will need to offer more. There are additional designs lined up as we grow. We definitely want to expand to women’s wear as soon as we can. We are already started designing styles that will work with our signature fabric. As far as other categories, we would like to develop knit bottoms and tops for women as well tops for men. Is there any reason why you developed these two styles? 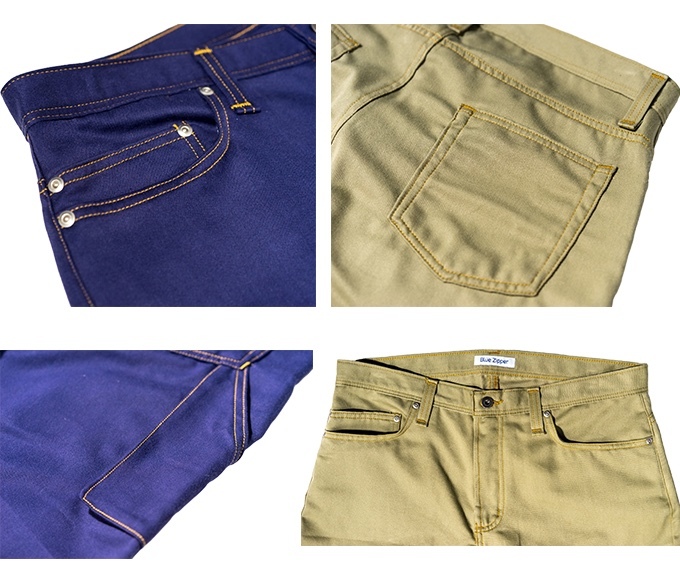 We are making our pants out our a twill fabric and felt that the jean cut style would work well with this material. It is a fit and design that most people are comfortable with. 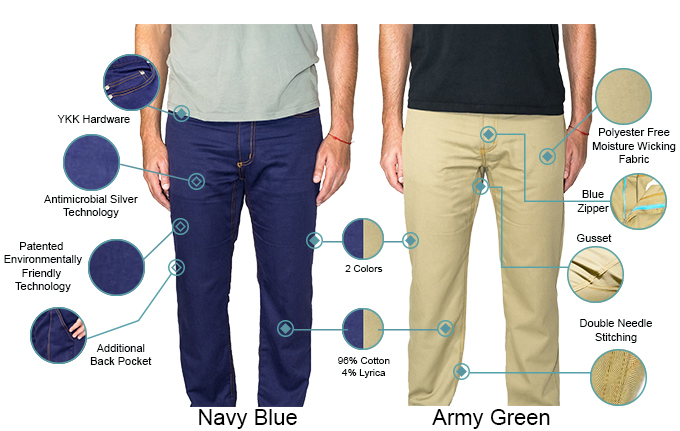 The silhouette for both styles of pants are the same. The only difference between them is an additional (6th) back pocket. Getting the fit right is very important and we wanted to focus on that and add more styles later. We are currently exploring several avenues of capital. This is a business that relies on capital. The fabric and technology work, the challenge is getting people to understand it. For this reason working with small retailers and other retail options is part of our business plan. We have calculated the price of the product as a retail product. There are a lot of stores that still engage their customers in a retail setting and not just on-line. This kind of setting will help people understand what we have developed. We will continue to grow our social media side of the business as well as sell directly online. We plan on offering free shipping and 100% guarantee on our product. Thanks Stuart for sharing your great fabric with the UrbanMeisters community. Readers, polyester has sneaked up on our wardrobe pretty much like how plastic has permeated everyday life to a great extent. Let’s weed this out one by one with products like Blue Zipper. This sustainable start up is read to go, but needs funding to do so. If you are looking to invest in a sustainable fashion project or know someone who does, contact us and we will put you in touch with the team. Support their eco-initiative by sharing this article and follow them on Instagram and Facebook to stay updated with their latest projects. This is NOT A SPONSORED POST! We wanted to present this promising new alternative to polyester pants to our UrbanMeisters community under our Green Product Hunt.